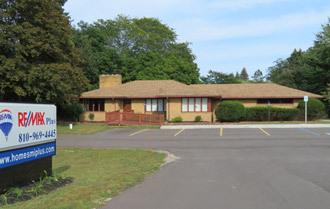 This building has an additional rental unit that the owner has been using for storage, possible rent of $800 per month. It has an over head door and full bath with 1100 Sq Ft of space. In addition to this property I have the adjacent parcel to the North also for sale, its currently a 5 bay coin car wash on .78 of an Acre that's just over 1 acre of prime commercial property on 3 roads for $349,900 This building is located in the zone for possible use for Medical Marijuana Provisioning centers.